Athlete’s foot is a fungal infection that occurs between the toes and occasionally on other parts of the foot. Although not particularly dangerous, athlete’s foot can be a huge source of irritation for those unfortunate enough to experience it. The infections may cause itching and burning sensations, as well as cracking and peeling of the affected skin. The main culprit behind athlete’s foot is a group of tiny fungi known as dermatophytes. These fungi are responsible for a whole host of other infections, including jock itch and multiple types of ringworm. When they come into contact with human skin, dermatophytes feed off nutrients found in keratinized material. With the fungi responsible for athlete’s foot, these nutrients are typically found in the toenails. Dermatophytes thrive in moist environments, which is why they commonly build up between the toes. Humid environments can contribute to the development of athlete’s foot, as can tight shoes that squeeze the toes together. 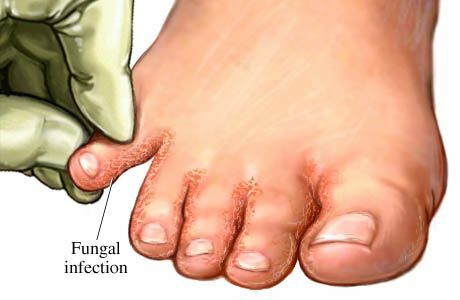 Coming into contact with someone else who has athlete’s foot or objects infected with the fungus can spread the fungus. Objects commonly responsible for spreading athlete’s foot include shoes, towels, mats and floors. The most common symptom of athlete’s foot is itchiness. The itchiness may be concentrated to one specific location or it may surround the entire foot. A stinging or burning sensation may also accompany itchiness of the foot. In many cases, the skin in between the toes and on the soles of the feet will begin to crack or peel. The symptoms of athlete’s foot can be annoying, but the good news is that the fungus is easy to treat and even easier to prevent. Simply make a point of wearing well-fitting shoes, keep your feet out in the open as often as possible and always wear your own sandals when visiting a locker room.